As stated in previous articles, when we discuss recycling we often think of plastics, aluminum, glass, paper, cardboard, and similar commodities. What about another item commonly thrown away? Food. “Recycling” food seems a little unsettling, but composting is a recycling of sorts. Composting is mixing various organic substances, such as dead leaves, food scraps, grass clippings, allowing them to decay, and using the new material for fertilizing soil. Compost can be made from any number of organic materials in a number of combinations. 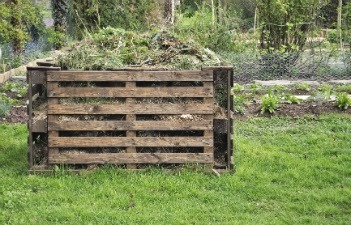 You may compost directly in a pile on the ground or you can buy or build a bin to hold your compost heap. The best compost material comes from creating the optimal conditions for decomposition: Air + Water + Carbon + Nitrogen = Compost. Green stuff (high in nitrogen) - to activate the heat process in your compost. Perfect heat-generating materials include young weeds (before they develop seeds), chicken, and grass clippings. Other green items that compost well include fruit and vegetable scraps, coffee grounds and tea leaves (including tea bags), vegetable plant remains. Brown stuff (high in carbon) - to serve as the "fiber" for your compost. Brown stuff includes autumn leaves, dead plants and weeds, sawdust, straw, old flowers, dried flowers, and hay. Other items that can be composted that you may not have thought of before include paper towels, paper bags, cotton clothing (torn up), and eggshells. Air - It is possible to compost without air (anaerobically), but the process uses different bacteria and an anaerobic compost pile will take on a sour, vinegar-like smell. It may also attract flies or take on a matted, slimy appearance. If you believe your compost pile needs more air, turn it and try adding more dry or brown stuff to open up the structure. Water - Your pile should be about as damp as a sponge that has been wrung out. Depending on your climate, you can add water directly or rely on the moisture that comes in with "green" items. A lid on the compost bin will help to keep moisture in. If a pile gets too much water in it, it might not get enough air. Temperature - The temperature of the compost pile is very important and is an indication of the microbial activity of the decomposition process. The simplest way to track the temperature inside the heap is by feeling it with your hand. If it is warm or hot, everything is decomposing as it should, but if it is the same temperature as the surrounding air, the microbial activity has slowed down and you should add more materials that are high in nitrogen to the bin. Soil or starter compost - This is not necessary, but a light sprinkling of garden soil or recently finished compost between layers can help to introduce the correct bacteria to start the compost cycle a little more quickly. If you are pulling weeds, the soil left on the roots may be sufficient to serve this purpose. Compost starters are available, but probably not necessary. After choosing the combination of materials you will put into your compost, you must turn it every week or two. You may have chosen a “layered style” or a “mixed style” of composting. Regardless, each style has to be turned to ensure even decomposition and a successful compost heap. With all of the organic items and leftovers that are able to be added to your compost heap, there are also some materials that you should avoid in your composting. Never compost the following items for reasons of health, hygiene and inability to break down: meat and meat scraps, bones, fish and fish bones, plastic or synthetic fibers, oil or fat, pet or human feces (except for manure of herbivorous creatures such as rabbits and horses), weeds that have gone to seed, diseased plants, disposable diapers, glossy paper or magazines, coal and ash, and cat litter. Place these items in with your regular trash collection. You should also try to avoid composting bread, pasta, nuts, and cooked food. They don't break down very easily, become quite slimy, and can hold up the heating, rotting-down process. If all goes well, you will eventually find that you have a layer of good compost at the bottom of your bin. You may now remove this newly composted material and spread it onto or dig it into your garden beds for nutrient-rich soil. For more information on a composter near you, visit www.findacomposter.com.